You may not have even realized that there are a handful of cars out there with a top-shelf trim that costs more than double the base version’s price. With their super-powerful engines, long wheelbases, and endless luxury features, it’s not surprising to find this category dominated by hyper-performance and hyper-luxury vehicles. And these prices don’t even reflect the array of available (and expensive) options. So consider your choices, because if you’re going to buy one of these cars, you might as well get the most expensive one. 10. The Nissan GT-R has always struck us as a great-value supercar. Each engine is hand-crafted, and Nissan’s attention to detail approaches the fanatical — the tires are filled with nitrogen, as regular air isn’t stable enough. At $101,770, the base Premium GT-R will give you 545 horses from its 3.8-liter twin-turbo V6, able to sprint from 0 to 60 mph about as quickly as you can say “0 to 60.” Of course, it you want an even faster GT-R, you’ll need to pony up a few more dollars for the GT-R Nismo — $48,220, to be exact. A 47% price increase is a steep premium to pay, but in exchange for your hard-earned $149,990, you’ll be rewarded with the most track-focused Japanese supercar made today. 9. With a Ferrari engine and Pininfarina design, the Maserati GranTurismo looks and sounds thoroughly Italian. And its 454-hp rear-wheel drivetrain, coupe body, and magnificent leather interior provide an ideal platform for the activity that gave this model its name. Maserati celebrated its 100th anniversary with a special MC Centennial Edition in 2015, offering the same chassis, powertrain, and specs as the base Sport trim, but dressing up the inside and outside of the car with lots of carbon fiber, red accents, special triple-layer paint, and the Maserati Centennial logo on the door sill. Moving from the base Sport, at $132,285, to the MC Centennial edition costs a little over $33k, but the most expensive version of the GranTurismo is the MC Centennial Edition Convertible, at $182,009. Many shoppers would probably consider a bit less than $50k too much to turn a coupe into a convertible, but Maserati clearly believes its special limited-edition convertible deserves this premium. 8. The Audi A8 is one of those cars that makes us wonder, “If the Pontiac G8 had a luxury interior, would it still be around?” Full-size sedans are an ever-shrinking segment, and we’ve wondered in the past why they continue to exist at all. How can automakers afford to keep producing cars like these when shoppers continue to flock to crossovers and SUVs instead? Well, Audi, BMW, and Mercedes-Benz seem to have figured it out: big power, luxurious interiors, and a huge price tag. The Audi A8 L 3.0T starts at $81,500 and provides all-wheel drive, 333 hp, and 325 lb-ft of torque. Ramp up to the $137,900 A8 L W12, however, and you upgrade to a 500-hp, 463-lb-ft 12-cylinder engine that comes at a $56,400 premium. Of course, you’ll also be enjoying features like massaging rear seats and a head-up display, so maybe it’s money well spent. 7. Tesla’s new model still hasn’t seen much traction since its official release. In a lot of ways, the Model X is more of the same from Tesla, and the company’s all-electric cars still have a long way to go to become both affordable and viable. The Model X ranges from $80k for the basic 70D variant to $142k for the P90D. The P90D gains an extra 20kWh in battery capacity, which would increase the Model X’s range an extra 37 miles, if it weren’t for the “P” at the beginning of that name. That “P” stands for “Performance,” of course, and it gives the Model X an additional 204 electric hp. This, coupled with the P90D’s aptly named “Ludicrous Mode” speed upgrade, can get this electric crossover to 60 mph in 3.2 seconds. Despite all that speed, the P90D will still have a 250-mile range on a single charge, which is plenty for an electric vehicle of its size. 6. 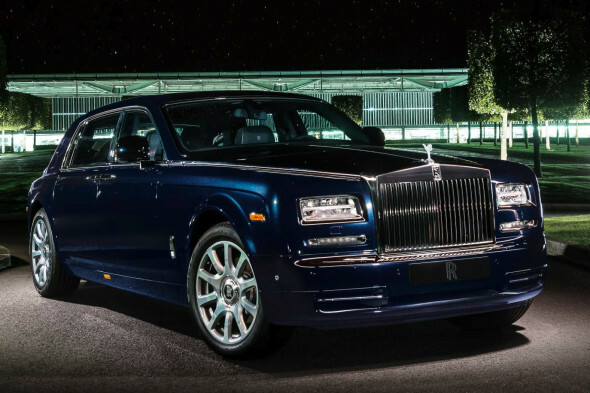 As a maker that’s always catered to wealthy shoppers, we’re not surprised to find Rolls-Royce on this list. We consider the Coupe and Drophead Coupe separate models, leaving the Rolls-Royce Phantom sedan available in just two trims, Base and Extended Wheelbase, or “The ultimate Rolls.” Neither is inexpensive, with the Base priced at $417,825 and the Extended Wheelbase at $492,425. So for just shy of $75k, you’ll get a hair under 10 inches of extra legroom in the back seat as well as “more opportunities for Bespoke personalization,” i.e. an extensive range of expensive options that will take the price even higher. Examples given on the Rolls-Royce website include a partition wall, fold-out picnic tables, extended door panniers, a refrigerator, and a custom interior featuring turquoise silk, cherrywood, bamboo, and mother of pearl inlays. That last one may not be everyone’s first choice, but it would certainly make your Phantom unforgettable. 5. Any time a manufacturer makes a car with multiple engines, a fairly sizeable price hike can be expected between the “base” engine and the upgrade. When the difference between the two engines includes a couple of cylinders and 235 horsepower, you can rest assured that difference in price will be downright enormous. The least expensive Jaguar F-TYPE has a 340-hp V6 engine, a manual transmission, and a 0-60 time of 5.1 seconds. All this performance comes together in a $65,000 sports car. While $65k isn’t chump change, it’s hard to argue against the F-TYPE’s value. That is, until you take a look at Jaguar’s most expensive sportscar. The F-TYPE Project 7 offers a re-tuned version of the 5.0-liter V8, good for 575 horsepower and a spring to 60 in 3.8 seconds. It’s available only as a convertible, with rear-wheel drive and an 8-speed automatic transmission. The price for this race-bred machine? $165,000. So, when the time comes, you’ll have to ask yourself – do you buy a Project 7 or two and a half V6 F-TYPEs? 4. Land Rover priced its flagship Land Rover Range Rover well into the realm of premier luxury SUVs. The price difference between the entry trim, at $85k, and the top-of-the-line SV Autobiography LWB would be enough to buy a second Range Rover. Yes, the SV Autobiography LWB adds about 130% to the price of the already-luxurious base Range Rover. Of course, every Range Rover comes with all the luxuries you could ask for in a high-end vehicle, so what makes the SV Autobiography LWB more valuable than two of its lesser brethren combined? Well, in addition to the 8-inch longer wheelbase, the SV Autobiography comes with a much larger engine: the 5.0-liter V8 found in the Range Rover Supercharged variant pumps out 210 more hp than the basic 3.0-liter V6 (550 vs. 340). But the true difference lies in the vast list of standard features and available options that transform the Range Rover from a luxury SUV to a truly over-the-top executive vehicle most fitting for the 1%. 3. The Porsche Panamera luxury sedan probably broke more 911 fans’ hearts at Auto Shanghai in 2009 than the debuting Cayenne did in 2002. But those two models changed Porsche from a struggling sports-car brand to a profitable luxury-car maker with a sedan and an SUV (two since the Macan arrived in 2015) supplementing its range of sports cars. As a luxury sedan from a premium maker, no one should be surprised to learn that the 2016 Panamera’s MSRP varies widely, from just under $80k in base Sedan form to over $200k in Turbo S Executive long-wheelbase form, or even higher with options. What does multiplying your Panamera investment by 2.5 get you, beyond just under 6 inches more of overall length? It bumps the powertrain from a rear-wheel-drive 3.6-liter V6 with 310 hp and 295 lb-ft of torque to a 4.8-liter V8 with 570 hp, 553 lb-ft, and an active all-wheel-drive system, increases top track speed from 160.9 to 192 mph, and cuts the car’s 0-60 time from 6 seconds to 3.6. Like that math? 2. The Lamborghini Aventador, which has set the standard for ridiculously over-powered midengine supercars, ends its 5-year lifespan with the 2016 production run. Competitively priced with the likes of Ferrari and McLaren, the Aventador ranges from $399,500 to $522,880. This starting price is such that the actual dollar increase is the third-highest increase on this list, but that extra $120,000 represents only a 30% markup. That would be rather unremarkable if it weren’t for its already astronomical price tag. The reason behind the price increase between the Aventador LP 700-4 and LP 750-4 SuperVeloce Roadster is very apparent: you’re paying about $86,400 for that 50 (well 49) extra horsepower. That’s about $1,700 for each extra horse you’re pulling out of that V12. If all cars were priced that way, your $19,000 Toyota Corolla would have about 11 hp. Also, it’s worth noting that a lot of features are removed from the SuperVeloce — including the navigation system, sound-proofing, and interior trim — to reduce the weight as much as possible. This might be the only only example of losing features as you pay more on this list. 1. Last week, we wrote about how the Mazda MX-5 Miata would be a great, affordable alternative to the BMW M4 convertible. While the Miata is certainly a good alternative to most cars, we missed an opportunity to mention some more appropriate comparisons. Maybe it was the weather, or perhaps we were operating on too little sleep, but the much more fitting alternative to the little Mazda runabout would be the Mercedes-Benz SL-Class. A true roadster, the SL-Class comes in many forms, ranging from the SL400 to the SL65 AMG. Like the M4, no version of the SL-Class comes cheap, and, in fact, it holds the honor of having the largest price disparity between its least and most expensive trims. While the comparatively spartan SL400 comes in at $85,050, the 621-hp SL65 AMG retails for $217,550 — an incredible $132,500 difference. What additional features or better specs would convince you to buy a top-of-the-line trim? This entry was posted in Car Lists, Car Minded, Car Shopping, Exotic Cars, General Chat, New Cars, United States and tagged Audi, jaguar, Lamborghini Aventador, Land Rover, Maserati, mercedes-benz, Nissan GT-R, Porsche, Porsche Panamera, Range Rover, Rolls-Royce, Tesla. Bookmark the permalink. What a beautiful set of cars … I’d love to have any of them in my driveway! ← What’s Your Stance on a Car’s Best Stance?